How do I unsubscribe from a calendar in Mavericks? They say it's only easy if you know the answer, but the question: "How do I unsubscribe to a calendar in Mavericks Calendar?" is sometimes harder than it should be to resolve. After a pleasant night spent at the Crazy Horse Club, Paris in 2002, I was lucky enough to watch Steve Jobs reprise his New York introduction of iCal at Apple Expo, Paris. To be honest the sheer usefulness of iCal (now known as Calendar) eluded me at that time. Things change. These days Calendar is essential. 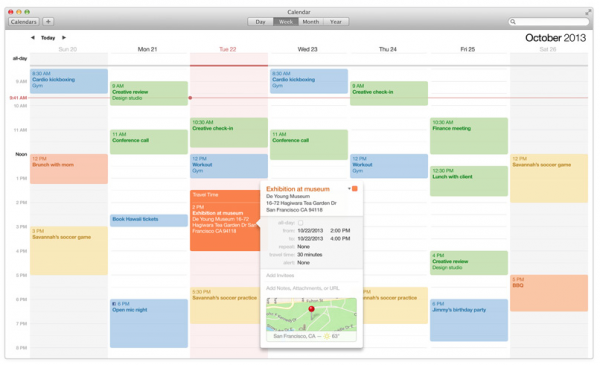 One iCal feature enabled users to subscribe to third party calendar feeds. At some point I did so using my then Mac and .Mac account. I've been through numerous Macs, iPods, and iPhones since, and as a result of a few technical faults and poor planning my calendar still receives that feed. It's a busy list that repeats annually -- so how do I get rid of it? "Click on the Calendars button, choose (click) the calendar that you want to delete, and choose Edit>Delete." (Or CTRL-click on the item and select Delete from the contextual menu. The problem is that while more recent calendar subscriptions (such as these) usually create their own category, which you can easily delete using the instructions above, older feeds did not -- they became part of the Calendar you subscribed from. You can delete individual entries from such feeds, but cannot cut your connection to the feed unless you are still using the same Mac you subscribed from, so repeating events will repeat. The only alternative to lose these is to delete the Calendar category you are receiving that subscription from. If you choose to do this then you will need to separate your personal Calendar entries from the one that is receiving the feed. Click on the + button in the top left window to create a new Calendar field. Open the old Calendar currently receiving the information you no longer need, and choose Year view. You must then manually select each Calendar entry -- double click to open this in week view. If an entry is one you wish to keep and is not from the subscribed feed you're trying to lose, Control-click the item and use the Calendar item which should have a black arrow to its right. Select the new Calendar field you created earlier. That entry will now migrate to the new Calendar. Repeat this step for each calendar item. Delete the calendar that is receiving this no longer required subscription. These changes should eventually be reflected across your iOS devices. This is very cumbersome so I'd be grateful if any reader can dream up a less time-consuming way to lose such legacy calendar subscriptions.